Today, the global peasants’ movement, La Via Campesina, released a statement in support of Kate Wilson, in advance of her critical human rights hearing at the Investigatory Powers Tribunal next week. The case is as a result of her abusive relationship with Mark Kennedy, the undercover police officer. The hearing will hear the police’s attempts to shut down her case, despite admitting that managers new about her relationship with Mark Kennedy and that they have abused her human rights. 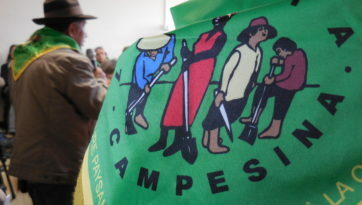 La Vía Campesina is a global movement which coordinates peasant organisations, representing 200 million peasants across the world. It is a coalition of 182 organisations in 81 countries, advocating family-farm-based sustainable agriculture and was the group that coined the term “food sovereignty”. Ms Wilson has worked with Via Campesina for ten years. “I am deeply moved to receive the support of Via Campesina. It is a reminder of the importance of global struggle and solidarity. La Via Campesina (LVC), on behalf of the 200 million of peasants it represents, publicly expresses support and solidarity with Kate Wilson, who has been supporting and struggling with us shoulder to shoulder for many years. Kate, in such a brave way, is running a case about police infiltrations, human rights abuses and rightly demanding to access information and to put a stop to organised practices of targeting social and environmental activists. In different environments, we share a common experience of being threatened economically, physically and emotionally. LVC expresses its deepest solidarity with this important struggle against institutional sexism and institutional prejudice. LVC stands with Kate Wilson and people fighting for justice.